Director/Screenplay – Pascal Laugier, Producers – Christophe Gans & Richard Grandpierre, Photography – Pablo Rosso, Music – Joseph Loduca, Visual Effects – Def2shoot & Duboi (Supervisor – Alain Carsoux), Makeup Effects – Benoit Lestang & Emmanuel Pitois, Production Design – Bertrand Seitz. Production Company – Eskwad/H Factory/France 3 Cinema/Castel Film Studio/Liaisons Films/Canal+/Cinecinema. France, 1958. Anna Jurin is sent to the Saint Ange orphanage in a remote area of the French Alps. The orphanage is closing down and all the children are sent away just as Anna arrives, leaving her alone with the housekeeper Ilinca and the mentally ill Judith. What Anna is hiding from the others is that she is pregnant, the reason she has been sent away by her employers. Before the children leaves, one of the girls tells Anna about the Scary Children. Soon after, Anna starts to hear ghostly noises and to see things. She is drawn to investigate Saint Ange’s past and starts to uncover the grim secrets that the orphanage wants to be kept hidden. This French ghost story marks the directorial debut of Pascal Laugier. Laugier was a former assistant to director Christophe Gans and directed the Making Of documentary about Gans’s Brotherhood of the Wolf (2001). (Christophe Gans is also listed as a producer on Saint Ange). Laugier subsequently went onto make the grim and genuinely disturbing horror film Martyrs (2008), the reality bending child abduction thriller The Tall Man (2012), the reality bending home invasion film Ghostland/Incident in a Ghostland (2018) and was for a time announced as the director of the remake of Hellraiser (1987). The set-up in Saint Ange – a remote school in the mid 20th Century – reminds of Guillermo Del Toro’s ghost story The Devil’s Backbone (2001), which was set during the Spanish Civil War. 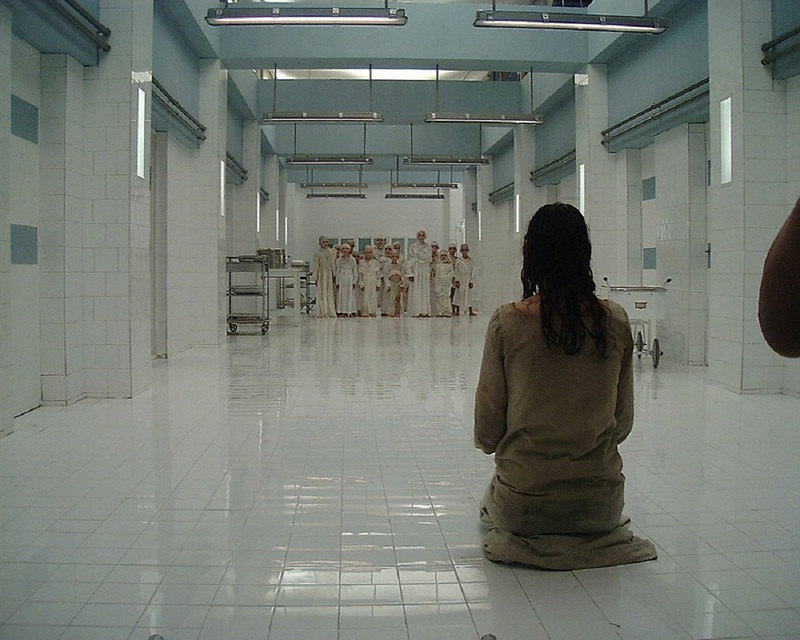 Pascal Laugier creates an often subtle atmospheric build-up – like the opening scene where the boy goes into the bathroom and has his face smashed into the mirror by unseen creatures; and an excellent building of tension that comes as Virginie Ledoyen and Lou Doillon enter the bathroom, where the faces of children suddenly appear behind the mirror at the same time as someone starts battering on the door. There is also a very effective sequence where Virginie Ledoyen looks down from a second story window and sees Lou Doillon playing hide’n’seek as Dorina Lazar puts out the washing, and then hears the sound of Doillon coming into the room and sees the curtains stir, but when she looks out the room sees that Doillon is still playing outside. Laugier also makes effective use of the dream wakeup jolt. Saint Ange is promisingly a film that never goes for cheap jump effects, rather where Pascal Laugier believes in the development of overall mood. While Pascal Laugier develops the atmosphere well, Saint Ange remains a film that builds but ultimately fails to go anywhere. The ending reached is a dog’s breakfast of loose ends and vague and untied plot strands that leaves one scratching their head in puzzlement – it is not entirely clear who the Scary Children are and why they were killed in the basement laboratory. What is Judith’s connection to the murders? What exactly is the secret that the school is trying to hide? Did Judith kill the cats? Not to mention also how Virginie Ledoyen’s fate comes as a major downer. The end of the film is akin to reading a thriller where someone has torn out the last chapter. It is this confusing series of loose ends that the film goes out on that kills the otherwise reasonable build-up that Pascal Laugier has crafted.